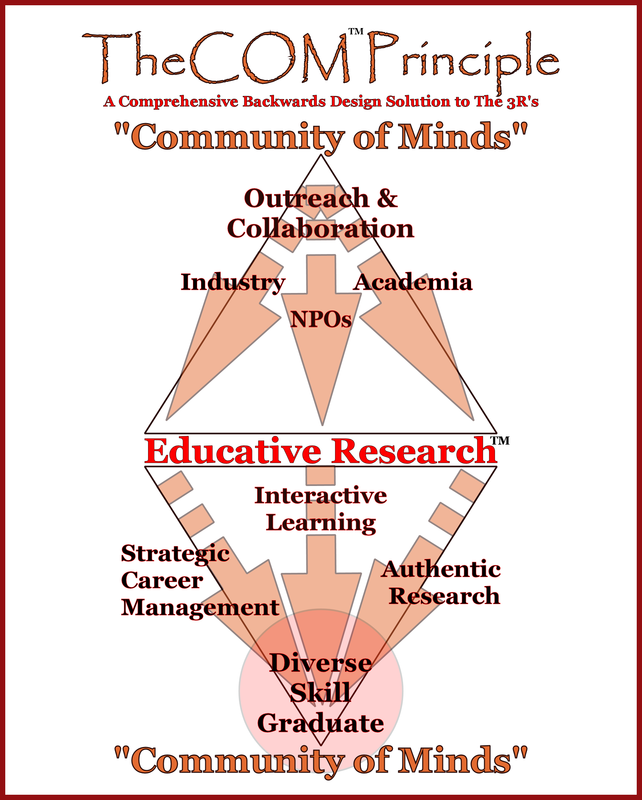 The Community of Minds (TheCOM™) Center for Educative Research™ seeks to serve as a catalyst and nucleating factor for building and cultivating Diverse Communities that can expand and enhance scientific research, education and training to increase Recruitment, Retention & Results (The 3 R’s) of STEM graduates. Objective – to create an Educative Research™ program and Certification that facilitates and signifies the comprehensively trained, or Diverse Skill, graduate employers are looking for (academic or private sector). Filling the Gap – this effort is a direct response to the numerous calls for reform in higher science, technology, engineering and math (STEM) education. While a large body of teaching and learning research has been and continues to be done, the cultural shift required for comprehensive integration of these principles across entire degree granting programs or institutions is still lacking. 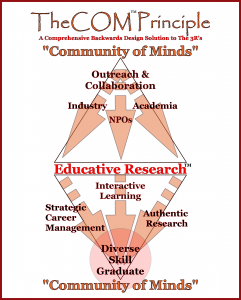 A novel element of our approach is building The Community of Minds (TheCOM™) as a resource to truly achieve this mission. TheCOM™ – is comprised of scientific educators, researchers and professionals across various disciplines and job sectors. As each member contributes its strengths to the Community they receive what they need to fill their gaps and meet their goals. Inputs – insight regarding skills & experiences students need; insight into problems of pressing global need; as well as various more active participation. Outputs – Certification & modular “tool box” components (Best Practices for Educative Research™ program development & assessment) to achieve cross-trained, Day 1 ready employees; larger scale research projects; increase The 3 R’s. Educative Research™ – Takes a fresh look at education and research and reconstructs them to address the previous mentioned “call.” The resulting program will produce graduates with the Diverse Skills employers want most. Strategic Career Management (SCM) will teach students to identify and target the Diverse Skills (“hard” and “soft”) needed for their career paths of choice. Proven Interactive Learning approaches and an Authentic Research framework will facilitate student learning of Core Concepts & Competencies. Community-based research focused on achievable solutions to pressing local and global needs will develop students’ awareness of context and applications for science in society showing them the “why” they do science while they are still learning the “how.” TheCOM™ approach will instill value for diverse perspectives in solving complex problems. Interactive learning through discussion and TheCOM™ chats (both in and outside class) along with other lab and lecture modifications will develop students’ critical thinking and communication skills and will provide them with direct access to a variety of scientific professionals. TheCOM’s™ Center for Educative Research™ Initiative is currently collaborating with Calvin College’s Biology department faculty to develop the first Educative Research™ project, Biological Investigation of Multi-level Ecosystems (BIOME) and associated curriculum. Once a set of Diverse Skills-based objectives for graduates of Calvin College’s Biology program are established, we will identify opportunities and strategies to achieve these objectives by scaffolding each course in the curriculum to maximize student Retention and Results. As these two metrics are strengthened, we believe they will positively impact Recruitment of diverse students into the program.